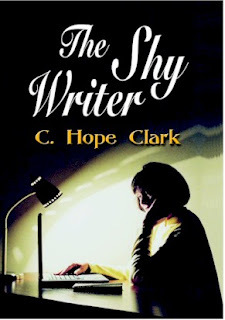 The Writer's Chatroom presents C. Hope Clark, creator of Funds for Writers, author, and speaker. Today I'm welcoming Joselyn Vaughn to Reviews and Interviews to tell us a bit about herself and her newest book, Courting Sparks. I am currently a stay at home mom with a set of three-year-old twins and a one-year-old daughter. I write in the rare moments when they are all sleeping. I should be sleeping during some of these times, but that doesn’t happen. The little one has a sixth sense for knowing the exact moment I have finally gotten comfortable in bed or actually fallen asleep. She will wake up and be awake for at least twenty minutes and I will be awake for the next hour. Before children, I worked as a Reference Librarian at my local library where my favorite part of my job was buying books. What else would it be? I started writing about a year before the twins were born and finished my first novel when they were three months old. I grew up in West Michigan on a retired dairy farm and have always loved the charm and closeness of small towns. After getting married, my husband and I tried out the big city for a while and decided the pace just wasn’t for us. We moved to a small town and live there with our children and two beagles and drive a grand total of thirty miles a week. It’s awesome. Please tell us about your current release, Courting Sparks. Dusting off the ashes of a failed relationship, Daphne Morrow decides she is ready to date again. But when her scorched prom photos are discovered to be the ignition point for a small forest blaze, marking her as the prime suspect for the arson, she finds they’re not the only part of her past sparking interest. After a friend’s wedding provides a romantic interlude with her longtime friend Noah Banks, Daphne tries to explain away her attraction to him: the atmosphere of the wedding, his resemblance to her ex, his heroic efforts as a volunteer firefighter. Still, their desire just won’t sputter out. When the arsonist strikes much closer to home, Daphne fears she must risk Noah’s friendship to find the culprit and clear her name. She’ll know their love is real if his interest isn’t put out by her need to uncover the truth. The idea started with a young woman, Daphne, who is going to be a bridesmaid in several weddings because all her friends are getting married. I thought she would meet a cute groomsman and the story would go from there. That didn’t happen. Her best male friend shows up at the reception late because he’s a volunteer firefighter and was fighting a fire. Then the questions popped up: can you fall in love with someone you’ve known forever? Is it worth the risk of destroying your friendship? I have rough drafts for two stories done and I keep wavering between which one to work on. They both involve characters from my first book, CEOs Don’t Cry. One is about Tara, the woman hired as a receptionist at the end of the book and the other is about Mark’s aunt, Minnie, the owner of the Lilac Bower. Both stories have some really fun scenes and I can’t decide which one to finish first, although Tara’s story comes first chronologically. I don’t know if I would consider myself a writer yet. I am, but it’s not the first identifier that I would use to describe my life. Some part of my still thinks I’m pretending all this and it’s not real. I couldn’t be cool enough to have two books published. And yet, I would tell anyone who asked me if when they could identify themselves as a writer, that if they were writing even if it was only for themselves that they were a writer. Funny how your mind works. I squeeze writing time in during naps and rest-time. The twins no longer sleep in the afternoon, but I make them take a rest. Sometimes the little one coordinates her nap with this time and I can get some writing done. I also take a notebook or printed pages with me whenever I go somewhere without them. You can get a lot done in the doctor’s waiting room. I went through so many phases of career choices. They all had some creative element in them. Art teacher, architect, novelist, textbook writer, I don’t remember what else. I settled into librarianship because I could be around books even though I wasn’t ready to write one yet. I’m sharing my favorite holiday cookie recipes on my blog this month. So stop by and try them out. I wish I could send everyone samples, but I couldn’t squeeze time in to make them all. Hope you all have a happy and safe holiday season. 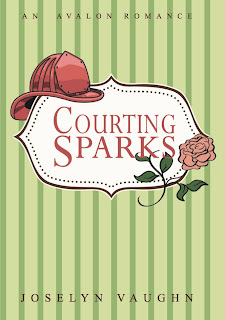 Here's the buy link for Courting Sparks. Thank you for stopping by and sharing a bit of yourself with my reader's today. Today I'm welcoming author Garasamo Maccagnone and Writers in the Sky who are on a virtual tour to promote Garasamo's recently released book, St. John of the Midfield. Born in 1959, Garasamo Maccagnone studied literature and journalism at Macomb College, Wayne State University, and Western Michigan University. Garasamo has enjoyed writing since the age of sixteen. He is inspired by the works of F. Scott Fitzgerald, Ernest Hemingway, John Dos Passos, and Jack London, and is currently working on his next book. Garasamo has owned a soccer club and coached and trained players for over twenty years. He lives with his wife, Vicki, and his three children in Shelby Township, Michigan. 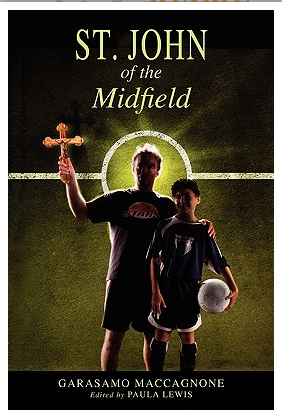 St. John of the Midfield tells the story of Bobo Stoikov, a former Bulgarian soccer player who escapes communist oppression. The story is told through the eyes of Mario Santini, a father on Bobo's team, and the son of a crime family boss. Mario, who wants to escape the world his father has created, ends up giving the nod that sets the tragic ending in motion. As he must protect his son from the sinister Sonny Christopher, Mario does what he has to in order to protect his son from being harmed, on the field, and off. It took ten years. I coached with a man named Rocco Mitkov for over fifteen years. Some of what he told me about his escape from Bulgaria inspired this. From there, it was all my imagination. The title of my next piece is, The Sorrows of Pebble Creek. The story is about the murder of a noted Chaldean acquaintance of the narrator's, who is cut down by assassins of Uday Hussein. The story is told after the funeral, and as the author tries to uncover a mystery involving his assassinated friend's family, the narrator uncovers his true feelings for his ex-wife and estranged family. The first time I sold a book to a non family member. I write daily. By doing so, it keeps you in a rhythm. It also keeps me sharp at the craft of creating meaningful sentences. When I wrote St. John of the Midfield, most of it was done between 2am and 5am. With my latest piece, I'm writing more in the 10am to 2pm time slot. Who can figure these things out? The entire story is written in my head first. I can actually see the words in the sentences in my mind's eye. Many times, while on the road, my wife will look at me while she's driving and say, “You're writing, aren't you?” She can tell by the look on my face, and of course, how quiet I get, that I'm typing sentences in my head. She knows to leave me alone. I wanted to be a baseball player. With three brothers and a bunch of neighborhood boys all around the same age, we always had good numbers to start a baseball game. If we weren't playing in the streets, or stick ball in the back yards, we rode our bikes to the sandlots behind Eisenhower Elementary School and played until dark. I ended up playing in college. I thought about pursuing a professional career, but then I met a beautiful girl who told me that if I married her we'd be together forever. It's been thirty years so I think I made the right decision. St. John of the Midfield can be purchased through this link. Included in my next release will be four additional stories entitled, The Note Giver, Sentiments of Blue, The Conversion, and Holy Thursday. My other written works include, The Affliction of Dreams, a collection of short stories and poetry, The Suburban Dragon, a children's book, and For the Love of St. Nick, an illustrated short story about two boys who seek the help of St. Nick after the tragic loss of their mother. I also want to thank you for taking the time to interview me. You're quite welcome. Best of luck with your tour! Thank you for joining us as we celebrate author Garasamo Maccagnone and his WITS virtual tour. Tomorrow, December 23, 2010, day eight, Penny Lockwood Ehrenkranz will host an excerpt from St. John of the Midfield and a Q&A written interview. Follow this blogger on Twitter: @pennyehrenkranz. Check out the full tour schedule. Today we are journeying into new worlds with Jacquitta A. McManus as she tours with BK Walker Books with her newest book, Labryinth's Door. 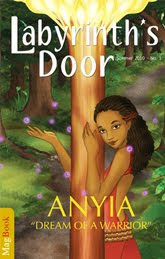 The first edition of Labyrinth’s Door is a story of a young girl, Anyia, whose dream of becoming a Nagoran Warrior is infused with adventure and danger. Running from her duties as a Yora, she dares to break tradition to follow her own dream, during a time when Empress Zarina threatens the magic treaty that protects her village. Hours passed before Anyia was able to move her body even slightly. Wiping the sweat off her face, she turned over and looked out between the bars. They were moving through the forest on a worn path heading toward a blue dome tent where an elderly lady sat at a table full of fruits, breads and gourds of water. The smell of the bread floated through the air. Anyia's mouth watered as she closed her eyes, thinking how great it would be if they gave her a piece. It’s crazy because when I first started working on the concept of Anyia and her history I didn’t see her as a main character. Anyia “Dream of a Warrior” wasn’t even a thought in my head. Don’t get me wrong, Anyia has always been a strong character, but her initial role was to support another character in a novel that I’m working on. It wasn’t until I got stuck with her and decided to write a short adventure on her that I started seeing her as a main character in her own mini series. The purpose of the short adventure that I wrote was to get a better understanding of her personality, her reactions and her dialogue. That 1500 word short story wasn’t very detailed, but it was enough to pique my curiosity. And that curiosity has turned into a mini series that I expect to span 4 MagBooks. I’m currently finishing up my first fantasy/adventure coloring book, Talee and the Fallen Object and working on the second installment of Anyia’s journey. Talee and the Fallen Object is a coloring book of action scenes that tells a fantasy/adventure story about, Talee, a girl who lives on the gas planet Gala and has her curiosity piqued when she sees an object fall from the backpack of a mail flyer and journeys out to see what it is. –– One thing I’m excited about with the coloring book is that children will be able to look at the scenes and create their own fantasy/adventure stories based off what they interpret in the scenes. I have all the scenes pinned up on my wall and my daughter loves to come and tell me her version of the story, which changes every time. In the second edition of Labyrinth’s Door, Anyia comes face-to-face with truth and betrayal as the world around her changes. –– Okay I know that’s not much of a synopsis but I’m still working out the storyline. I think the opening sequence has change four times … maybe even five, so the direction the overall story will take is still up in the air for now. But hopefully that will change soon. This is the first time I've met someone who has created a coloring book. I don’t think I have started considering myself as a writer. A storyteller yes, but a writer … not so sure about that. I love to tell stories, which is why I write. Writing the stories isn’t my favorite part of the process though; it’s just a necessary part of it. So I write to tell stories. Now, if you ask me when did I consider myself a storyteller, I would have to say about 2 years ago when I realized I had a lot of stories I wanted to tell in many different mediums. And let me tell you, there is nothing like creating new stories and worlds and working with an illustrator to bring them to life. That for me is the fun part. For instance, creating Anyia’s story, which is over 7000 words, was a different experience than creating Talee’s adventure, which consists of only 14 scenes. Both stories have the basic elements of storytelling, but required very different approaches to storytelling. And that’s not to say Talee’s adventure was easier to create, in some instances it’s harder because of its limits. I had to focus on different elements to bring the story out. Yes and No. I work on building my publishing company full-time, which is about producing stories. I, however, don’t write full-time. I have to divide my time between, art directing illustrations, print production, writing, and the needs of the company in general. I like to write and create when no one is around. I want my house empty. It annoys me when I can hear people in other rooms and etc. The only one that gets a pass is our cat, Foxy. Nothing that I can remember, I didn’t grow up with anything particular in mind. I was always fascinated with space and going into space, but never thought that was possible. I was also always interested in Disney movies, but didn’t think I could do that either. Now, I’m writing fantasy/adventure stories in new worlds. So in a way I’m a space traveler through my stories. Yes. One of my goals for Worlds To Discover is to create fantasy/adventure stories that I love and hopefully others will love as well. It’s my way of sharing what excites me with people like you. I have never enjoyed working so much. And this is just the beginning of my adventure in storytelling and I hope you will be part of it. If you would like to chat with me or follow my new projects you can find me on Facebook, Twitter, GoodReads, and my blog Journey of a Storyteller. I would love to hear from you. If you would like to order Labyrinth’s Door or Talee and the Fallen Object visit my website, or find me on Amazon.com. P.S. My coloring books will be sold exclusively on my website. And that’s it. If you have any questions just ask. And as always … let the adventures begin. Thank you for your time today, Jacquitta. Best of luck with the book tour. Folks, if you'd like to follow Jacquitta on her tour, her next stop is Friday, December 24 where she will be Guest Blogging at http://kristenhaskins.blogspot.com. The full schedule can be found here. Join Writer's Chatroom for a two-hour surprise chat to end one year and start off another. My guest author interview today is with Julius Thompson, whose latest novel, Ghost of Atlanta, will release in January. After high school, Mr. Thompson spent the next four years riding the "A" train to Harlem, in upper Manhattan, to earn a Bachelor of Arts degree from the City College of New York. At CCNY, which was located just a few blocks from the famous Apollo Theater, Wednesday afternoons were hard on the undergraduates. The matinee performances of the major R&B groups of the times were more tempting than attending a college lecture. Most of the time, Mr. Thompson succumbed to the temptation, but still earned a college degree from one of the best universities in the country. At CCNY, literature instructors like Prof. Thomas Tashiro, fueled the fire in him to become a writer. Mr. Thompson’s journey to compose a trilogy began in 1995. The fourteen-year fictional journey of Andy Michael Pilgrim from Brooklyn (A Brownstone in Brooklyn), to Philadelphia (Philly Style and Philly Profile), and finally Atlanta (Ghost of Atlanta) is now complete. In this pilgrimage, readers experience places that are filled with hopes, dreams, challenges and fears that make us human. Mr. Thompson is currently a Creative Writing/Publishing Instructor at Atlanta’s Evening at Emory’s Writers Studio. Please tell us about your current release, Ghost of Atlanta. In this novel, the reader follows Andy Pilgrim as he faces past issues that have haunted his life as he returns to Atlanta, Georgia. The setting is Atlanta in the 1980s. The reader follows Andy as he matured in the turbulent sixties in Brooklyn with the Civil Rights movement, his working career as a sportswriter in the seventies in Philadelphia watching the influence of drugs and gangs destroy young people’s lives, and in the eighties in Atlanta where he faces demons from his youth and sees the effects of reverse migration of African-Americans from the northern cities back to the new south. Andy’s thirty-year odyssey from Brooklyn, Philadelphia, and Atlanta showcase new life-altering situations and problems that faced African-Americans in the last half of the twentieth century. Purple Phantoms: The story of the haunting of a high school basketball team. I was a basketball coach for over twenty years. In that time, I had some players that were killed and I always wondered what would happen if they could come back and finish that season. This book is totally different from the trilogy and a chance to explore the use of second person point of view in a novel. I love traveling to book fairs and different book events. This year, 2010, I was a speaker at the Virginia Festival of the Book in Charlottesville, Virginia, the Roxborough Library in Philadelphia, the Buffalo Book Fair in Buffalo, New York and at the Eastern Parkway Library in Brooklyn, New York. I've also signed copies of my novels at the prestigious New York Is Book Country Festival in New York City, the National Black Arts Festival in Atlanta, Georgia, the AJC-Decatur Book Festival in Decatur, Georgia, the Gwinnett Reading Festival in Lawrenceville, Georgia and at the Miami Book Fair International in Miami, Florida. I've had book signings in the following book stores: Barnes & Nobles, Borders, Chapter 11, Books-A-Million, Nubian bookstore, the African Spectrum bookstore, Philadelphia's Robins Bookstore, and I've been one of the featured speakers at the Bedford-Stuyvesant Creative Arts Fair in Brooklyn, and I've been part of a panel of authors at the Auburn Avenue Research Library in Atlanta, Georgia and the Gwinnett County Library System. In 1965, I started writing at Bushwick High School in Brooklyn, New York. I was afraid and very insecure about becoming a writer. I asked my English teacher, Ms. Egan, "Can I be a writer?" She looked at me and said, “Do it!” I’ve never looked back. I’ve been a copy boy with the New York Times, and a full-time sportswriter with the Philadelphia Bulletin. I started writing my first novel in 1995 and I’ve enjoyed every moment. That is my goal: Become a full-time writer! Currently, I’m a high school language arts teacher at Redan High School in Stone Mountain, Georgia and a Creative Writing Instructor at Evening at Emory University. I write late at night usually around 10:00 PM and during the evenings on weekends. I’m a night writer! My creativity is in full swing after 10:00 PM. This is good and this is bad. I have to get up for work at 5:45 AM. Sometimes when I’m writing good I want finish writing until the wee hours of the morning. When that happens, I suffer through a long day of feeling tired. When I was writing A Brownstone in Brooklyn, one night I wrote over 2,000 words and finished around 4:00 AM. That meant I just didn’t go to work the next day. That’s the reason the trilogy was completed in twelve years. A Brownstone in Brooklyn was released in 2001, Philly Style and Philly Profile in 2007 and Ghost of Atlanta in 2011. I’ve always wanted to be a writer. I wrote short stories and thought I was writing novels. This was a way I could to express my emotions. This was an important emotional outlet for me. In my novels, I want the reader to experience places that are filled with hopes, dreams, challenges and fears that make us human! Ghost of Atlanta can be pre-ordered at the publisher's site. Thanks for answering my questions, Julius. Best of luck with your writing and teaching. Yes, it's that time again...time for the TWC Annual Organizing and Goal Setting chat. Join Writer's Chatroom for a two-hour workshop to get you set up and ready to make 2011 your best writing year ever! The Writer's Chatroom presents Rebecca York, author of over 125 novels and novellas. Romantic thrillers are her passion.